Request a quote for a bulk order for S. aureus CRISPR/Cas9 polyclonal antibody (C-terminal). Please fill out the form here below. Your local sales account manager will get in touch with you shortly and send you a quotation based on your requirements. 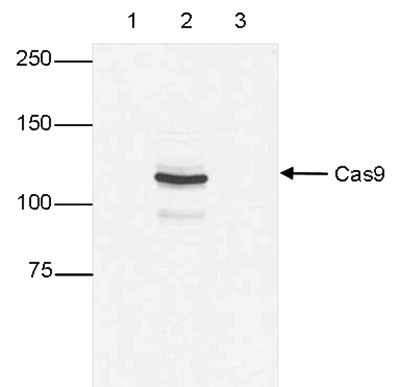 Polyclonal antibody raised in rabbit against the C-terminus of the S. aureus Cas9 nuclease (CRISPR-associated protein 9) using a recombinant protein. 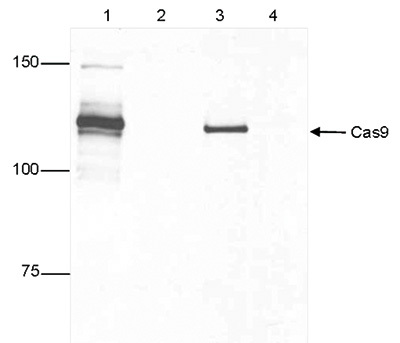 Western blot was performed on protein extracts from HEK293 cells (lane 1), HEK293 cells transfected with S. aureus Cas9 (lane 2) and HeLa cells transfected with S. pyogenes Cas9 (lane 3) using the Diagenode antibody against CRISPR/Cas9 (Cat. No. C15310259), diluited 1:10,000 in PBS-T containing 3% NFDM. The marker is shown on the left, position of the Cas9 protein is indicated on the right. IP was performed on whole cell extracts (200 μg) from HEK293 cells transfected with a Cas9 expression vector (lane 1 and 3), or untransfected cells (lane 2 and 4) using 1 μl of the Diagenode antibody against CRISPR/Cas9 (Cat. No. C15310259). The immunoprecipitated proteins were subsequently analysed by Western blot with the monoclonal CRISPR/Cas9 antibody (C15200230). Lane 3 and 4 show the result of the IP, the input (10 μg) is shown in lane 1 and 2. Transiently transfected U2OS cells expressing SaCas9-T2A-GFP were fixed with 3.7% formaldehyde, permeabilized in 0.5% Triton-X-100 and blocked in PBS containing 2% BSA for 2 hours at RT. The cells were stained with the S. aureus CRISPR/ Cas9 antibody (Cat. No. C15310259) diluted 1:1,000 in blocking solution at 4°C o/n, followed by incubation with an anti-rabbit secondary antibody coupled to DyLight594 for 1 h at RT (left figure). Nuclei were counter-stained with Hoechst 33342 (right). The middle figure shows IF with an anti-GFP antibody. Diagenode strongly recommends using this:	S. aureus CRISPR/Cas9 polyclonal antibody (C-terminal) (Diagenode Cat# C15310259-100 Lot# A2555-001). Click here to copy to clipboard.